Living in Western Australia’s far southwest means that we are always aware of the changes in season. Like Georgiana, I grew up in Britain and whenever I think about what she was doing at different times of year, I know that she, too, would always have thought about the differences between the climate here and there. Today we’re experiencing more of Winter’s windy blasts and the heavy rain that makes this region so lush and green but it’s August, and I remember (as she must have done) the long, light evenings of summer and the warm days of what was often the English year’s kindest, most colourful month. Today, I looked back at Georgiana’s diary for her last ever summer before she sailed away from England, never to return. And yes, it was a fine day! On August 16th, 1829, the newly-married Georgiana Molloy had just arrived in London to wait for the time when she could board the ship, ‘Warrior’, that would take her to Western Australia. The day before, she had said goodbye to her mother, sisters and brothers, believing she would probably never see them again. She was right. Parting from her mother under such sad circumstances seems to have made Georgiana forget their arguments and the falling out that had caused her to leave home nearly two years earlier. Took leave of my dearest Mamma who begat me & fervently prayed over me. O Lord, bless & keep her & lead her into Glory. During the next few weeks, she was left alone a great deal while her husband, Captain John Molloy, made their arrangements for travel and caught up with old friends from his regiment during the Napoleonic War. But on their first day in the city, which was a Sunday, they went to church together. Oversleeping after their long journey from Rugby the day before, they attended a late service at a church close to their lodgings off Oxford Street. So tired we did not get up in time for church. We went to church in Langham Place, but Oh how different to Cardross & Roseneath the poor man did not comprehend what he wished to say. Fine day. 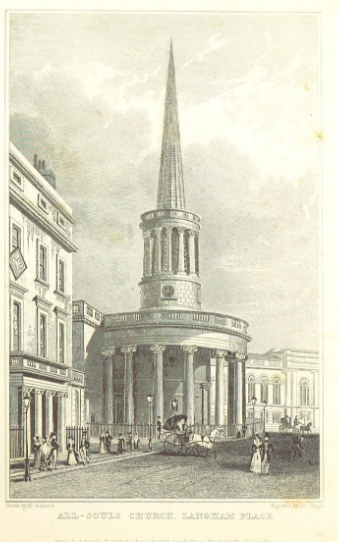 All Souls Church in Langham Place was newly built when the Molloys went there. Designed in the Greek style by the King’s favourite architect, John Nash, its unusual circular vestibule of Bath stone is still striking today, positioned right opposite the well-known and very recognisable façade of BBC Broadcasting House on Regent Street. 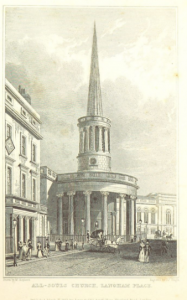 If you find yourself with some time to spare in one of London’s most popular shopping areas, Oxford Street, just walk North from Oxford Circus and you’ll find All Souls looking very much as it did in 1829. After many months enjoying the engaging, inspiring sermons of Reverend Robert Story in Scotland, where she had been staying, Georgiana was disappointed with the lack of passion and meaning in the sermon at All Souls. 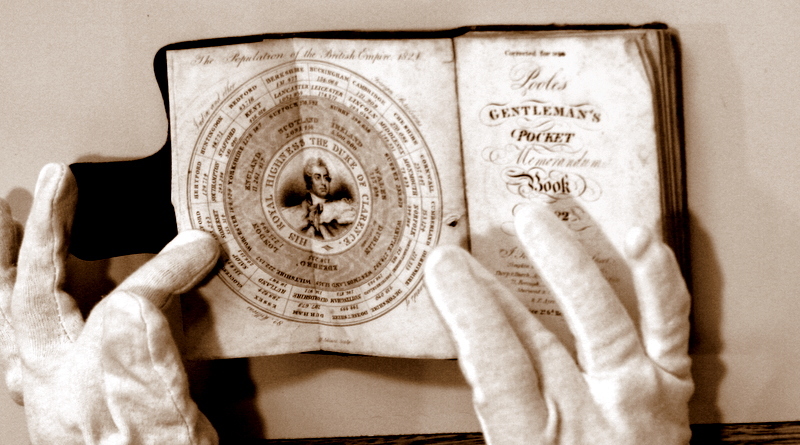 It was not the only thing she would find strange in London over the following weeks. Bought some silk stockings & pelerines. We walked a good deal about town. It is a very strange place.